General relativity may be formulated as a gauge theory more than one way using the quotient manifold approach. We contrast the structures that arise in four gravitational gauge theories, three of which give satisfactory gauge theoris of general relativity. Of particular interest is the quotient of the conformal group of a flat space by its Weyl subgroup, which always has natural symplectic and metric structures in addition to the requisite manifold. This quotient space admits canonically conjugate, orthogonal, metric submanifolds distinct from the original space if and only if the original flat space has signature n, -n or 0. In the Euclidean cases, the resultant configuration space must be Lorentzian. This gives a 1-1 mapping between Euclidean and Lorentzian submanifolds, with induced Euclidean gravity or general relativity, respectively. Published by Institute of Physics in the Journal of Physics: Conference Series. Publisher version is available for download through link above. Content from this work may be used under the terms of the Creative Commons Attribution 3.0 licence. Any further distribution of this work must maintain attribution to the author(s) and the title of the work, journal citation and DOI. Wheeler, J.T. 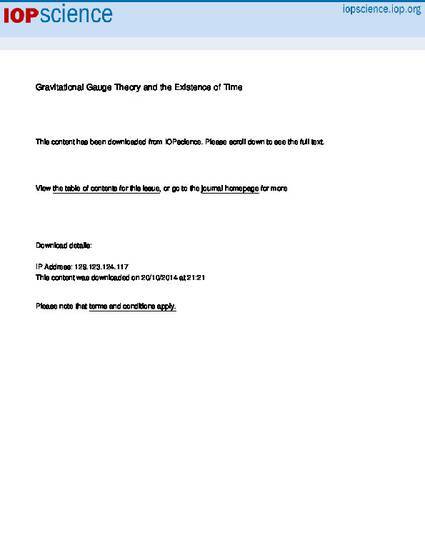 Gravitational gauge theory and the existence of time (2013) Journal of Physics: Conference Series, 462 (1), art. no. 012059, .